Welcome to celebrate the release of the community art piece Queerkätkö (Queercache) by the artists Kalle Hamm and Dzamil Kamanger on Monday 26.6.2017 at 5 pm at the Helsinki City Museum (Aleksanterinkatu 16)! Six persons based in Helsinki have taken part in the planning of the art piece and the piece is part of the project Finland 100 – in Rainbow Colors. 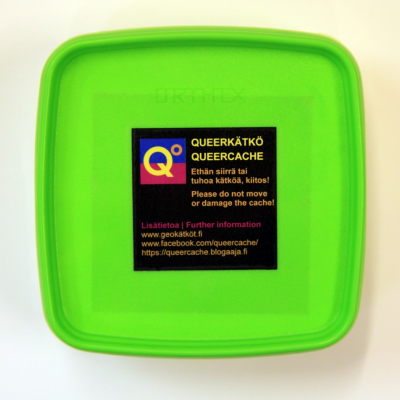 Queerkätkö (Queercache) lends its form and structure from the popular geocache hobby. The idea in geocache is to look, with the help of GPS, for different caches. The queercaches tell about places, experiences or events in the Helsinki region that have been important for transpeople and for minorities within the queer minority, such as culture and languages minorities or persons with disabilities. Helsinki City Museum is wheelchair accessible. The museum’s facilities are situated on different floors (1st, 2nd, and 4th floors). Each floor can be accessed by lift or stairs. The information desk, the coat racks and toilets as well as the museum shop and café El Fant are situated on the 1st floor. The accessible entrance is through the main door (Aleksanterinkatu 16).